"My latest quilt pattern is called Windmills at Night. I designed it specifically for beginning quilters, using pre-cut fabric strips called “jelly rolls”. The bright red fabrics touch off the black and white fabrics beautifully, and this striking lap quilt will make a fabulous addition to your decor. "Although it may look complicated, Windmills at Night is a simple pattern. A beginning quilter can easily tackle this project, and a more experienced quilter can easily finish this 40″ x 52″ lap quilt in a weekend." 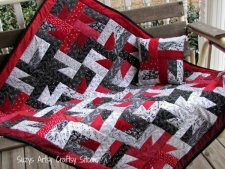 Check Out Suzy's Tutorials: Over 100 Tutorials & Patterns! 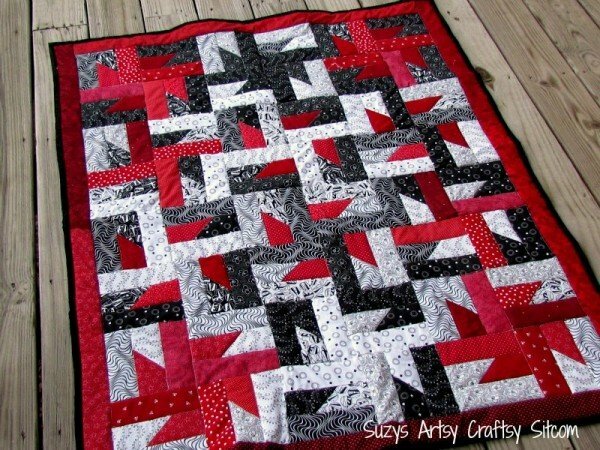 What do you think of Suzy's quilt?